Ramseur NC native, lifetime family friend and neighbor of T.A.H. 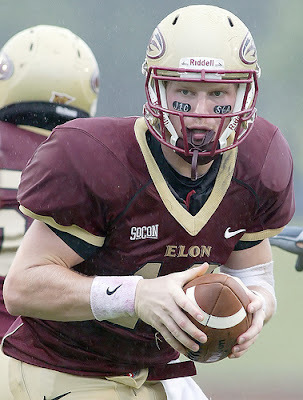 Pop Culture Editor Young A.T. and the all-time leading passer in the history of Elon and Southern Conference football, quarterback Scott Riddle has agreed to sign a contract with the NFL’s Jacksonville Jaguars. Riddle was on a plane earlier this morning headed to training camp. Riddle, who was a first-team all-league selection by the SoCon's coaches in 2010, capped a stellar career by throwing for 3,231 yards on 274 completions in 10 games. Riddle tossed 28 touchdown passes to lead the league. By leading the SoCon in passing yards as a senior, Riddle became the first quarterback in the storied history of the SoCon to lead the league in passing for four consecutive seasons. He also topped the league in pass efficiency (154.5) and total offense (318.8 yards per game). Twice on the season Riddle threw for over 400 yards, including a 452-yard, five-touchdown performance in the season-ending win over Western Carolina. Riddle ended the year having thrown a touchdown pass in 22 consecutive games, surpassing his own mark of 21 set early in his career. Riddle finished 13th in the voting for the 2010 Walter Payton Award and was named to Phil Steele's 2010 FCS All-American Team. Riddle ranks fifth all-time at the FCS level with 13,264 career passing yards. In his four years Riddle completed 1,168 passes in 1,779 attempts, a completion percentage of 65.65 percent. In his four seasons, Riddle threw a SoCon-record 105 touchdown passes and passed for 200+ yards 40 times, 300+ yards 23 times and 400+ yards three times. He tossed at least one TD in 44 of his 45 career outings. "Jacksonville was the first team to call and showed a lot of interest," said Riddle. "I've had great coaching throughout my career to prepare me and I think I've developed a lot over the last four years. This opportunity is a blessing and I'm very grateful for this chance. The situation in Jacksonville is a good one for me…Hopefully I can compete for a spot on the roster."